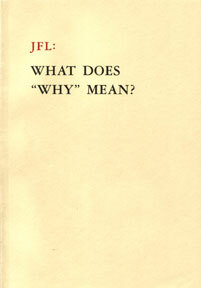 21 October 2006 / Books / JFL: What Does 'Why' Mean? Originally published in 2002 by Octavian Esanu and Akademie Schloss Solitude in Stuttgart, Germany. This edition published in 2005 by Octavian Esanu and J&L Books, Inc.